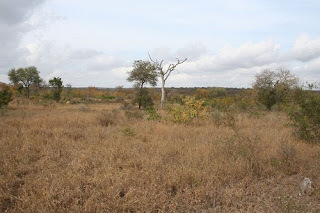 It was mid-afternoon half way through the second week of the Decadal gashuku. Tim Hull and I were shuffling along a dusty track somewhere in the African savannah. The group with which we’d started running had long since dispersed; the front pack having disappeared into the far distance while behind us about 20 or so stragglers were spread out over several kilometres. The morning had started out promisingly enough; we had a very short run – only 5 or so kilometres – followed by some chi sau (sticky hands drills from wing chun) and then some taiji. So far so good. We had breakfast and rested as the sun came out and the sky cleared away from the previous night’s storm. We were in for a hot, dry day. “Tell your people to put on their running shoes. And make sure you each have a water bottle.” I asked where we were going but Wyatt shook his head. This was as much as he knew. While looking through some bins hoping to find an old coke bottle, young Damien (a fellow I’d enjoyed training with in my old home dojo and with whom I’d shared a previous gashuku experience) ran up and suggested I ask for help from some campers who had just parked their caravan 500 metres up the shoreline of the dam. I took his suggestion and thankfully they were able to provide me with 2 (used) plastic 250 ml juice containers. I filled these with water from the tap at the ablutions block and raced down to the kitchen tent for the roll call. 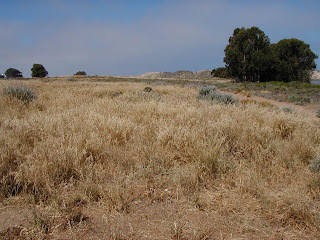 Eventually we reached a point I conservatively estimated to be 11 km from the campsite – and turned around. The front pack, including Greg, bolted off and the rest of us continued to shuffle, spreading out into an ever thinning line under the hot African sun. All I could think of was to keep putting one foot in front of the other. 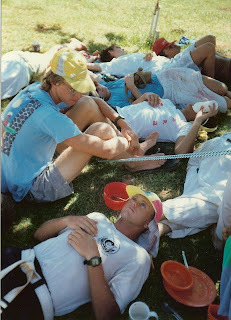 Despite careful rationing of our water, both Tim and I had exhausted our meagre 250 ml supplies. Since I knew that we were, at worst, about 6 km from the campsite I was confident that we would get back safely. Maureen had not kept up with the group and had turned back at an early stage, so I was reasonably sure that she was already back at the camp. Looking over my shoulder I could occasionally see my brother Nenad about 500 metres behind me. He was running with Rod (a heavily built fellow who is still the only person who has ever beaten me in sanchin pushing!). I knew that Nenad could take care of himself. Moreover Rod had cleverly brought with him a purpose-built backpack filled with about 3 litres of water. If worst came to worst, we could stop and wait for Rod who would surely have some reserve to permit a sip or 2. 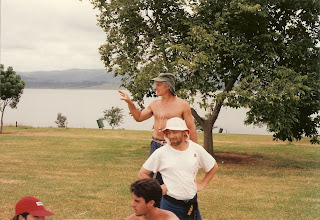 The dangers of dehydration were however about to become apparent: Just as Tim and I came over the crest of a hill we found Greg staggering off the track, heading for a swamp that was part of the Midmar Dam catchment. Not wanting to delay our own return to the camp, Tim and I continued our shuffle, confident that Greg would be taken care of by Rod and Nenad. We did indeed make it back to camp safely, albeit suffering from heatstroke and rather severe dehydration. 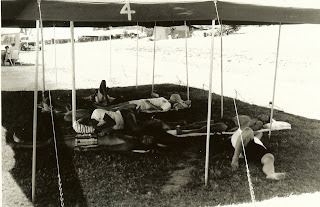 I drank enough water to make my stomach swing, then lay down under the shade of the training tent, my head pounding and my ears ringing. Greg and many others were in fact soon picked up by Deshi Tony who, having returned to the campsite early, drove back in a "bakkie" or ute (tray back) laden with bottles of water. Tim and I had beaten Tony's car back to camp by a matter of minutes. As I lay spreadeagled under the shade of the canvas I wondered grimly if the “achievement” had been worth it.